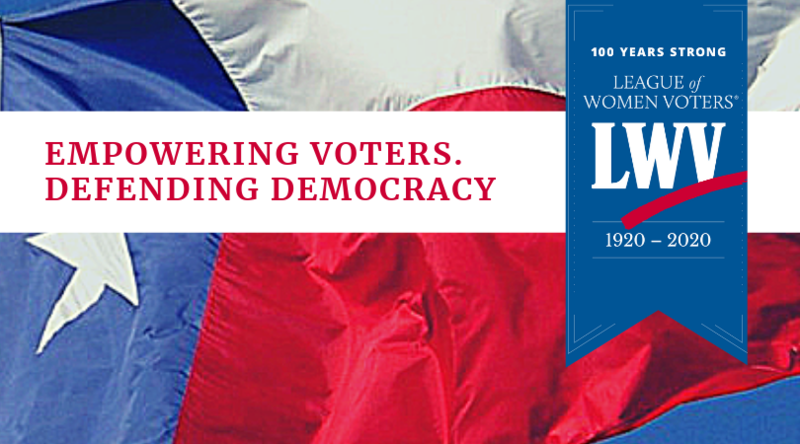 Austin – The League of Women Voters of Texas is disappointed that SB 9 passed the Senate today. The League of Women Voters of Texas members will lead efforts across the state to stop SB 9 and similar bills from being passed in the Texas House of Representatives. League action alerts have generated 2476 emails from grass roots constituents to their legislators on voting and election reform this session -- over 1000 in the last week against SB 9. League of Women Voters President Grace Chimene was at the Capitol with other League members who came to the Capitol to express their opposition to SB 9. “We represent 8000 members and supporters from all across Texas. We have rural members and urban members -- as far north as Wichita falls and as far south as the Rio Grande Valley, west to El Paso and east to Beaumont. We volunteer before and during elections, registering voters: volunteering for Election Protection, getting out the vote and working at the polls. We are nonpartisan.We never support or oppose parties or candidates. We are very disappointed that the Texas Senate has passed SB9,” asserted Ms. Chimene. The negative impacts for voters in Texas if SB 9 is passed far outweigh the positive aspects of the bill. SB 9 adds penalties to many imagined problems and further complicates our already overly complicated voting process. “SB 9 is not a solution to false rumors of in-person voting fraud, instead it makes it harder to vote and scarier to participate,” says Chimene. SB 9 threatens voters with jail time and enormous fines. Voters could be punished for innocent mistakes, such as filling out their voter registration form wrong. It also exposes innocent people to arrest for vaguely defined conduct such as individuals who are assisting voters or exercising their right to free speech will face new confusing penalties for “impeding a walkway, parking lot, or roadway” up to 500 feet from a polling place, an area larger than a football field. SB 9 expands dangerous new powers to law enforcement. It gives law enforcement complete legal immunity from prosecution for committing election-related crimes, in order to conduct undercover sting operations against community-based organizations. In addition, SB 9 gives state officials more access to voters’ private information. Attorney General Ken Paxton would be given direct access to the electronic voter registration database, which includes Social Security Numbers, Driver License Numbers, and other personal information. Texans, and the courts, have already rejected this information being shared with “voter fraud” panels. The mission of the League of Women Voters is to empower voters and defend democracy. League volunteers across the state work diligently to encourage civic participation by registering voters, providing our non-partisan Voters Guides and hosting non-partisan Candidate Forums, as well as introducing and supporting legislation to modernize Texas’ voting systems. Chimene concluded, "Our 8000 members and supporters stand firmly against legislation like SB 9 that limits citizens voting rights and will continue to organize, agitate, educate against this and similar legislation that limits citizens' voting rights."